CLACKMANNANSHIRE is bounded on the North by the Ochill-Hills; on the South by the firth of Forth; on the East by part of Perthshire; and on the West by part of Stirlingshire. It is about eight miles long. and where broadest but five. This is a plain fertile country towards the Frith; but the rest id fitter for pasture; however the lands below the Ochill-Hills abound with corn and pasture. About Alloa and Clackmannan are many coal-pits; and the inhabitants export great quantities of coal, not only to Edinburgh, but even to England, Holland, and France; for it yields the best and the greatest quantity of coal of any parts of Scotland, it being that distinguished in England by the name of Scots Coal. This county joins with the shire of Kinross in alternately sending a member to parliament, though Kinross in generally included in Fifeshire. Clackmannan, the county-town, stands on a rising ground, upwards of thirty miles from Edinburgh, and has a noble castle, adorned with fine gardens. But the most considerable place is Alloa, or Alloway, a sea-port, five miles to the east of Stirling, and the last on the Forth, where that river falls into the arm of the sea called the Frith of Forth. This town, though a village is larger and better built than most of the borough towns in the Kingdom. There is in particular one street that runs down to the harbour, the broadest and best paved of any next Edinburgh, with rows of lime trees on either side, as at Dundee, and in the towns of Holland. Alloa has a very considerable foreign trade, and several manufactures are carried on there, all which have some relation to navigation. They particularly make excellent sail-cloth which is said to be as good as that of Holland. There is a large rope-walk, and a warehouse of naval stores, as hemp, tar, &c, imported from Russia, Livonia, Norway &c, from which last place deals are also imported, and here are several saw mills employed in cutting or flipping (slipping?) them. A factory has likewise been settled here for the merchants of Glasgow, who have erected warehouses for stowing their tobacco, sugar, and other goods imported from the American colonies, in order to be ready for exportation to Holland, Hamburg, Bremen the Baltic, London, or wherever they are wanted; and also for stowing such commodities as they import from Sweden, Russia, &c. The river here is as broad as the Thames at London-Bridge, the water deep, and the tide flowing so strong that ships may lie their sides to the wharf, and load and unload their goods without the least difficulty. There are salt-houses all along the shore for boiling of salt, which is fetched away in great quantities by ships that bring other goods from Hamburg, Bremen or the Baltic. The Earl of Mar had a seat here formerly, called Alloway Castle, encompassed with fine plantations: the gardens taking up forty-two acres, and the wood, with vistas cut through it, an hundred and fifty. The entrance from the town on the west is by a pair of fine gates, through a spacious avenue, which leads to the area fronting the house, in the midst of which is a gladiator, and on the right hand of the area a spacious garden, with a fine terrace and bowling-green, adorned with lofty evergreens. On the south side of the house is a spacious parterre, beautifully adorned with statues and vases: and from thence to the river runs a fine avenue, from which, and from the parterre are 32 different vistas, each terminating on a remarkable feat (seat? ), or mountain, a some miles distant; one of them shows Stirling-Castle, which though four miles from hence by land, yet from the various windings of the river, is twenty-four by water. In the middle of the terrace is a fine bason of water, in the midst of which is a group of Cain killing Abel: and at the end of the river is a pair of pyramidical gated, where a ship of three hundred tons burthen may unload. There is a very long and wide avenue to the east through the wood, and between each vista from the parterre are wildernesses and little grottos. The Earl of Mar lost this fine seat by his rebellion in 1715, and the government, to whom it was forfeited, ordered it to be kept in good order. Extract from The New Statistical Account of Scotland, for Alloa, published. 1845. ALLOA, a burgh of barony, sea-port town, and parish, in the county of Clackmannan, 7 miles (E.) from Stirling; containing the villages of Cambus, Coalyland, Holton-Square, and Tullibody. This place, of which the name, in various documents Aulewoy and Alloway, is supposed to signify, in the Gaelic language, "the way to the sea," includes also the ancient parish of Tullibody. The parish church, erected by the heritors and feuars, in 1819, is a handsome structure in the later English style, with a square embattled tower surmounted by a lofty spire, together 207 feet in height, and contains 1561 sittings: the steeple of the old church is still remaining. The ancient church of Tullibody, which had been in disuse from the time of the Reformation, was restored and again appropriated to the purposes of divine worship. There are also places of worship for members of theFree Church, the United Secession, Independents, Wesleyans, and Swedenborgians; and anepiscopal chapel. The name of this parish, also spelled Alloway, means 'the way to the sea.' The parish is small, containing only 7 3/4 square miles. The River Forth, which rises at the eastern side of Ben Lomond, extends along the south side of the parish by a very circuitous course, a distance of four and a half miles to the west of the town of Alloa, and about one mile to the east, where it ceases to be a river and becomes a firth. There are several collieries in the parish. Before 1775, the colliers were attached to the properties in which they were born and were virtual serfs or slaves, supported by the master. 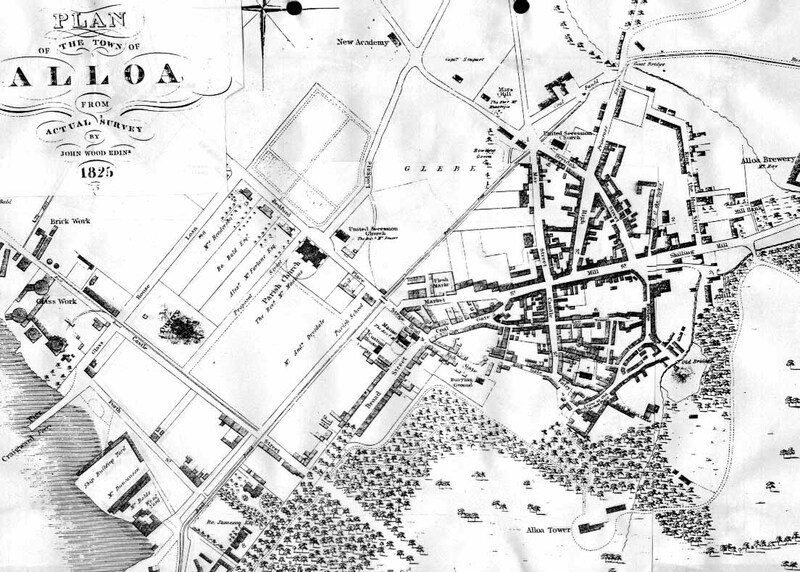 After the Act of Parliament which abolished the system, the colliers could move between collieries at will, and they were supported in their needs by the Alloa Colliers' Fund or Friendly Society which was founded in 1775. The ancient family of Erskine, the Earls of Mar, are the chief landowner in the parish and owner of collieries. Alloa House, their family home, burned to the ground in 1800 and one of the treasures lost was a picture on copper of Queen Mary, gifted by her to one of her ladies-in-waiting before her execution. The population in 1755 was 5816, in 1791 was 4802, and in 1841 was 7930. Sheep and cattle are raised in the parish and a variety of crops are grown including barley and oats. There are several mills and manufactories in the parish which make a variety of products from blankets to glass and pottery. There is a brewery for ale, which is shipped throughout the world. Alloa, is the county town and is industrious and properous. The village of Tullibody is about two miles west of Alloa. The church of Tullibody was built by king David I in 1149. It fell into disrepare after the Catholic Church was abolished, but about 1835 it was refitted as a Church of Scotland preaching-station for the benefit of the village and neighbourhood. Alloa was formerly a chapel dependent on the parish church of Tullibody, but afterwards it became a separate parish and swallowed up the mother church. Tullibody was united with Alloa in 1600. The old church of Alloa was declared ruinous in 1815 and a new one was built. There are ten schools in the parish including the parish school and an academy. The Clackmannashire Library was founded at Alloa in 1797 and it contains upwards of 1500 volumes. There are four other libraries and a reading room in the parish. There are four fairs held on the second Wednesday of February, May, August, and November. There are five hotels and inns, 38 taverns, and 30 grocers' shops selling spirits, which are more than the necessities of the people reguire. Coal is the only fuel used in the parish.